I never thought I would be able to say that I have a cookbook........but I now can. The most common question I hear every week during breakfast is "Do you have a cookbook we can purchase and take home with us?" I was always happy to share our recipes, and now they have been compiled in our first cookbook. So, thank you to our guests for being the inspiration. We have so many recipes we wanted to share that we have collected over the years from magazines, friends, or created in the kitchen here ourselves. We have modified many of these recipes to our taste and to our guests' satisfaction. We use flavors of fresh herbs from our herb garden here at Abbington Green to add that final touch. 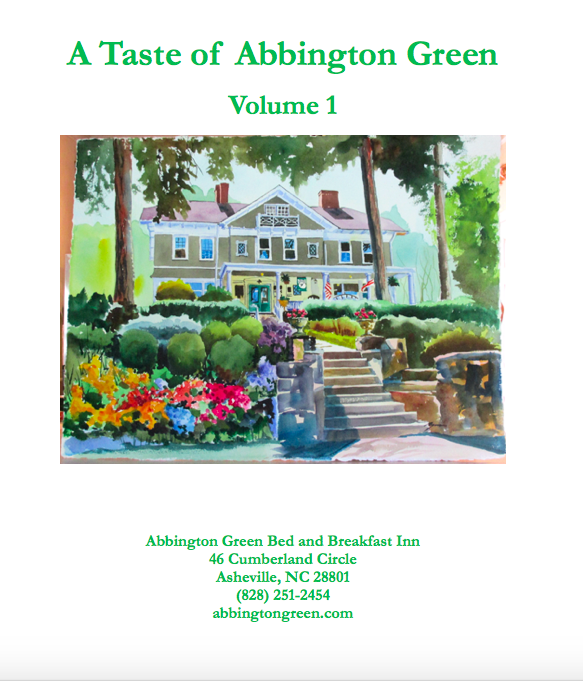 We called it "A Taste of Abbington Green, Volume 1" because I know there will be additional recipes we will want to share in another cookbook. There are 50 recipes in 7 sections including Fruit Courses, Sides, Breads and Jams, Main Breakfast Courses, Cookies, Social Hour Appetizers, and Cooking Classes we held here last winter. 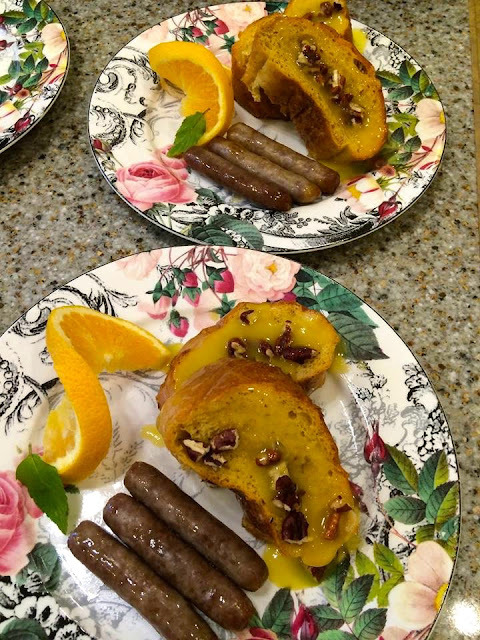 The most requested recipe is our house specialty, Orange Pecan French Toast. Yes, the recipe is in the cookbook! A special thank you to Bradshaw, my assistant at Abbington Green, for all the hours of typing my poor hand written recipes; our friends Ivy and Ken, who helped with binding the cookbooks; and Steve for always supporting me with my dreams, and to Mike Ryon for the beautiful cover image. I hope you enjoy cooking these recipes as much as I enjoy making them for our guests at Abbington Green. 50 guest favorite recipes from Abbington Green B&B Inn, your favorite Bed & Breakfast in Asheville's Montford Historic District. 7 chapters of Nick's tried and true recipes, from Breakfast favorites to 5pm Social Hour nibbles, to recipes from our March Cooking Class Series. It is a great souvenir of your stay with us! $20 + tax and $5.75 USPS shipping to you or your gift recipient. To order, call (828)251-2454 or send an email to info@abbingtongreen.com. Wishing you all a happy and delicious holiday season from Abbington Green Bed & Breakfast Inn! Love the cookbook and everything Abbington Green!